The X-Files was must see television from 1993 to 2002. I never missed a single episode on the same night they premiered. The subliminal creepy eerie theme song, the hybrid of the horror, science-fiction and police thriller, the sexual tension between Mulder and Scully - and the conspiracies. Like all good things, the X-Files television series had to come to an end. It has been 14 long years since I followed the onscreen adventures of Mulder. New episodes are almost here! The X-Files will return on Sunday Jan. 24, 2016 at 10 p.m. It will be a two-night premiere, with the show airing on Monday night at 8 p.m. in its regular time slot. Here is a short clip of the first minute of the new X-Files premier. Spooky Mulder says he never stopped chasing X-Files. There is so much potential in this paranoid, security obsessed drone filled world. Can Director Chris Carter recreate the magic? 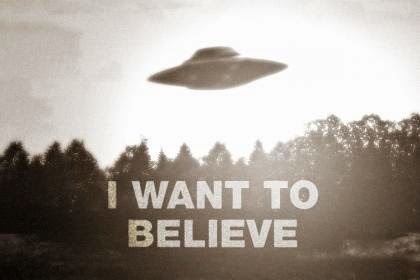 I want to believe he can! The X-Files Re-Opened is a 21-minute feature on the making of the event series.